We love supporting our local organizations and are filled with so much pride when we can provide for athletic departments and facilities. Congratulations to Athletes in Action on their continued revenue – we look forward to sending many more checks their way in the future. We love continually supporting our schools and organizations and are excited to send yet another check to Dayton Christian HS (OH). We have $700 on the way to DC with more to come! For a total of close to $45,000 in revenue so far, we are happy to provide Athletes in Action (OH) with a check for $9,000! We love helping organizations get the boost of revenue they need and helping keep the Pay out of Play. Congratulations to Dayton Christian HS for their $2,800 check! This is the latest of many we have sent the school, and we are eager to continually help Dayton Chrisitan’s Athletic Department. Our sister event, The Backyard Blitz, is gearing up for another year! The 4th installment of this annual Football Showcase will again take place at Wayne High School during Week #1 of the football season (Aug. 24-25, 2018). This year we will have 2 exciting games – featuring 1 game on Friday and 1 game on Saturday. 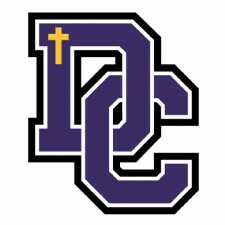 Saturday, Aug, 25th will have powerhouse Columbus DeSales coming down to take on Dayton Dunbar HS at Wayne Stadium starting at 6 pm. Tickets available now online: http://www.thebackyardblitz.com/ and will be available at the participating schools shortly. Follow @BackyardBlitz on Twitter and Facebook for more info and for information about all 4 teams. 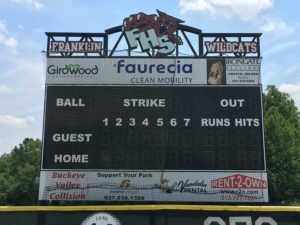 New City of Franklin (OH) Scoreboard Is Up! We are thrilled to have purchased a brand new scoreboard for the City of Franklin (OH)! The board looks amazing, and we are thankful to the sponsors who helped make this happen. Best of luck with the board and look forward to providing revenue soon! We love helping our local organizations prosper, year after year. Congratulations to Athletes in Action (OH) for another check to be used toward their sports complex. In addition to over $10,000 in the past year, we are excited to send another $4,500 their way! In addition to the over $7,000 in revenue we provided to the City of Franklin (OH) for their baseball scoreboard, we have raised close to $5,000 for their new softball scoreboard! Congratulations to the City of Franklin, and we are excited to to see the new board in action! 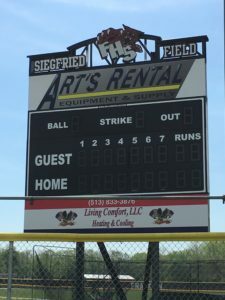 We love helping the City of Franklin and are proud of the Baseball Scoreboard we were able to provide them with the support of our amazing sponsors. This year, we provided over $7,000 in revenue already, with more revenue on the way. Congratulations to the City of Franklin! Next up is the Softball Scoreboard in the works. We are excited to send a check for $1,750 on its way to Milton Union High School (OH)! This revenue comes after providing the school with a brand new scoreboard last year, and we are so happy to be able to continue to help provide revenue to boost their athletics!